PGDPM-X (Post Graduate Diploma in Petroleum Management - Executive) is a two-year Programme, as a part of continuing education programme, at School of Petroleum Management, Pandit Deendayal Petroleum University, Gandhinagar leading to a P. G. Diploma in Petroleum Management. The curriculum is designed to meet the requirement of energy industry and more specifically the Oil & Gas sector. The PGDPM-X will be conducted on quarterly contact hour basis. The two years’ programme is divided into eight modules of seven days each. One module will be conducted every quarter. Classes will be held from Monday to Sunday once in a quarter. Module - I to Module – VI cover general management subjects necessary to build a composite perspective for managers. Modules –VII & VIII are sector specific modules focusing on Oil & Gas /Energy /Allied Sector Management. Module VII and VII also contain Independent Study Projects for experiential learning. The programme offerings pertain to General Management, Energy Economics, Supply Chain, International Geo-Political Affairs, Project Management, Oil & Gas Accounting, Finance, Maritime Affairs, Information Systems, City Gas Distribution, Renewable Energy and Law – to mention a few. Professionals working in the oil & gas/allied sectors, not having any formal exposure to management education would seek to add value to their profile by undergoing an oil & gas management course that also provides them a mix of campus plus off-campus learning experience. Organizations therefore, encourage their professionals to short-term periodic breaks and go for further studies in the field of oil & gas/energy sector management. School of Petroleum Management, being an oil & gas/ energy domain specific institution, and having an experience of offering such domain specific programmes in management for over 10 academic sessions now, caters to these needs of industry professionals. 2 Years; 8 weekly campus-contact modules and all other applicable academic/extension activities are spread over these two years. Note: Depending upon the contemporary learning needs some tweaking in the scheduling as well as courses may be possible. Executive General Management Programme leading to PGDGM-X (Post Graduate Diploma in General Management - Executive) is a two year Programme, as a part of continuing education programme, at School of Petroleum Management, Pandit Deendayal Petroleum University, Gandhinagar leading to a P.G. Diploma in General Management. The curriculum is designed to meet the requirement of various sectors of industry. The PGDGM-X will be conducted on quarterly contact hour basis. 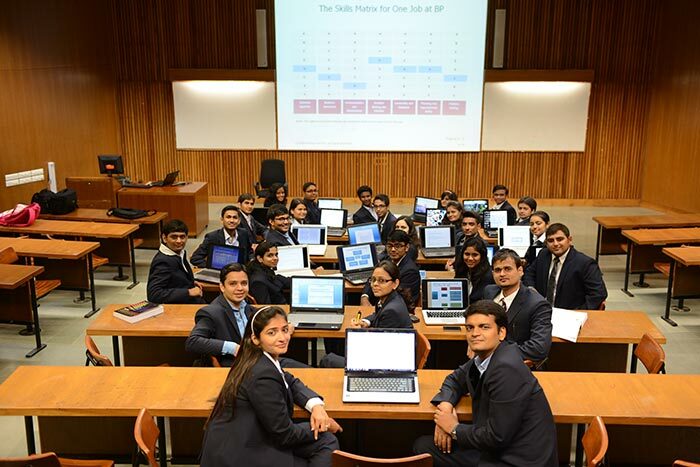 The two years’ programme is divided into eight class-contact modules of seven days each. One module will be conducted every quarter. Classes will be held from Monday to Sunday once in a quarter. Candidates are expected to complete the assignments, go through readings and consult the prescribed books/material when they are away from campus. Module - I to Module – III VI cover general management subjects necessary to build a composite perspective for managers. Module VII and VIII offer special courses from functional area perspectives. Module VII and VII also contain Independent Study Projects for experiential learning. The programme offerings pertain to General Management, Economics, Supply Chain Management, Business Communication, Project Management, Accounting, Finance, Operations Research, Information Systems, Marketing/ Finance/ Operations/ Human Resources Management, Corporate Governance and Legal Aspects of Business to mention a few. Professionals working in various industry sectors, not having any formal exposure to management education would seek to add value to their profile by undergoing a management course that also provides them a mix of campus plus off-campus learning experience. Organizations therefore, encourage their professionals to short-term periodic breaks and go for further studies in the field of management. School of Petroleum Management, being an institution that apart from Energy Sector Management, also since 2013, offers General Management programmes including Full Time MBA (General Management), caters to these needs of such industry professionals. Moreover our legacy of addressing executive learning needs since 2006 is our leading edge. Flexible part-time on -campus & off-campus learning model. Enriched learning from the interaction among the executives from various companies and from different points in the Oil & Gas/Energy Value Chain/ other industry sectors wherever applicable. Full access to the library and other facilities available while on campus. Benefits of co-curricular activities and participation in other programmes as per mutual convenience. Periodic Campus experience of interaction with young students. PDPU offers a complete academic eco-system wherein along with faculty of management, faculty of technology also present on the same campus. The participants will become alumni of School of Petroleum Management and can avail benefit of school’s rich library resources in the future also. A candidate must hold a Bachelor’s Degree, or an equivalent qualification recognized by the Ministry of HRD, Government of India, with at least 50% marks (45% for SC/ST candidates) or equivalent CGPA, of any University incorporated by an act of the central or state legislature in India or other educational institutions established by an act of Parliament or declared to be deemed as a University under section 3 of UGC Act, 1956. Candidates with minimum 3 years of relevant work-experience in Energy/ Infrastructure/ Oil & Gas Service Providers/ Related Sectors/ Energy Consulting etc. after acquiring the bachelors’ degree are eligible to apply. Candidates with minimum 3 years of work-experience in any sector of the industry after acquiring the bachelors’ degree are eligible to apply. The Bachelor’s degree or equivalent qualification obtained by the candidate must entail a minimum of three years of education after completing higher secondary schooling (10+2) or equivalent. In case of the candidates being awarded grades/CGPA instead of marks, the equivalence would be based on the equivalence certified by the university/ institution from where they have obtained bachelor's degree. Note: All courses carry a weight of 3.0 credits each.